Lofting a queen bed up five feet creates almost 200 cubic feet of usable space. The possibilities are endless: storage, another bed, a couch and living room area, a desk, a workshop, etc. (I chose a less conventional option: a grow tent full of vegetables and mealworms.) Using only a ladder for supporting the two edges not attached to the wall leaves the room a bit more spacious. I built two versions of this bed: one takes about two hours to build and the other a bit longer, depending on available tools and skill level. Design files are attached with the optional cable suspension shown (pic below) if you prefer to have a ladder on the shorter side of the frame or not all. Screws = A few bucks. Saw - table saw is ideal, circular saw or mitre saw is next best option. Jigsaw or hand saw also works. Optional tools: Pocket screw kit, Router, Joint Jig (I used a handsaw to create a simple box joint). You can get creative with how you set this up, so feel free to embellish and add your upgrades in the comment section. I added a white curtain at the foot of the bed and mounted a projector in my closet ten feet behind it so I could watch movies in bed. Kudos if you know this Sean Penn classic. Below are the CAD files if you want to tweak the design. Attach strips of wood on the wall to rest frame on while screwing into wall. Hoist frame onto these ledges andscrew a temporary 2x3 onto the opposite side of frame for support until the ladder is added. Ensure frame is level and screw into wall. There were only two walls that could support this bed and so I needed a way to support the freestanding sides. The first version used a ladder on one side and cables on the other. This was later replaced with a sole ladder on the longer side that supported both free sides, eliminating the need for suspension cables. A combination of 2x6s and 2x3s create a strong, somewhat light, very affordable frame that can be screwed into the wall on two sides. I used 2x3s screwed into the walls to rest the frame on and a rudimentary ladder I had lying around to hold the other sides up while attaching. Any piece of wood also works. The first version had the 2x3s mounted vertically to hold the mattress. The second version mounts them horizontally to create an additional 1.5" of head room. I also reduced the distance between the end slats and the frame to eliminate mattress sag. Below I have some tools and a grow tent vented to the outside. A stylish ladder is inviting and it's important that your loft does not scream, "He-Man Women Haters Club". Dividing the ladder in two creates shelving for many leather-clad books and such. I chose a 12° angle that is easy to climb yet doesn't protrude much into the rest of the room. A simple ladder can be created (pic above) or use a circular saw to cut stairs at an angle so they are flush with support beams and use a 1.5" router to create dado joints (pic below). Humans spend 1/3 of their lives sleeping, so why not make the one place you'll spend most of your life comfortable? The second ladder eliminated the top and bottom middle dividers for more storage options and a cleaner look. Dado joints eliminated the need for outside screws. Pocket screws on both the frame and ladder ensure no fasteners are visible. I wrapped the 2x3 slats with a sheet of fabric and stapled it from the top. This enabled me to use rough cuts that would never be seen and improves the appearance from below the bed. The first version had 3" eyehooks and 3/8" coated cable to hold the suspended edge of the frame. When these were no longer needed in the next build, I replaced them with 2" eyehooks and 1/4" coated cable for curtains that surround the bed and block out light and sound. It's amazing how much better I sleep with the curtains drawn shut. Magnets are an easy way to find and mark studs. A draw curtain system provides a sense of privacy and also transforms your loft into a dark and silent cave for both daytime power naps and longer-term hibernation. A shelf next to the head of the bed holds water, books, Advil, and smelling scents to help fall asleep and wake up. A Zoom digital recorder is held to the side by magnet and enables me to record my dreams in the middle of the night. Turns out that binge-watching Breaking Bad causes me to dream about the DEA breaking down the door to my lofted meth lab. In conclusion, this lofted bed creates an additional 50 square feet of bedroom and promotes better sleep. It's also fun to tell people about the mealworms I grow under my bed as a source of fat and protein. Please favorite and comment if you have questions and/or would like me to post information on the indoor garden. Thanks! Looking forward to trying this myself! Thanks for the instruction! Maybe you aren't concerned, but for other readers... The rigging hardware would be more structurally sound if you use thimbles with your wire rope as well as forged eye bolts. Of course, it is only as strong as the weakest link. Wire rope is super strong, but if you bend it around an eye bolt and exceed the specified bend radius, you weaken it. Yes. Some mattresses are excessively heavy. I have a queen size "hybrid" mattress that is 18" thick and it is easily over 200 lbs by itself without sheets, boxspring/frame, bodies, etc. Just about any hardware on the market is going to likely greatly exceed the specified weight of the load at a dead hang and have a safety factor built-in to its specifications... But any... Rustling about... May need to be accounted for in the safety factor of the design of the structure. As well as seismic considerations. Looks like the ladder relieves a lot of the load in the newer design. ...just how many bodies are you hiding in that mattress? 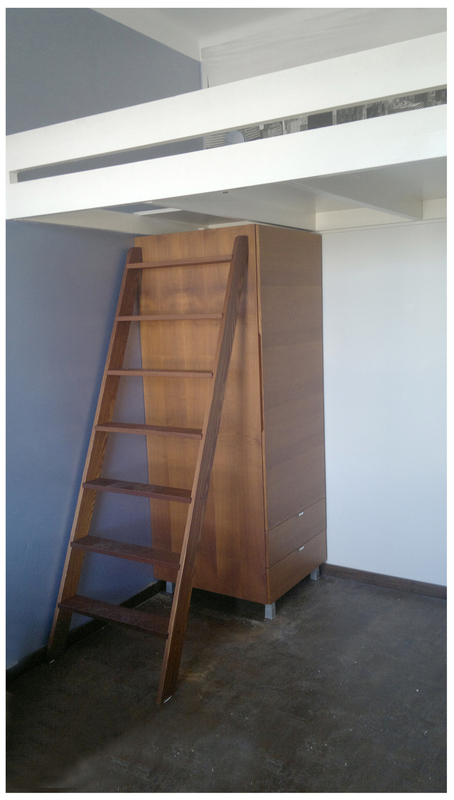 In Finland no one tells you what kind of bed you can build but mainly we have these kind of loft beds, see 4 legs. this design can also be used as modified storage space. Well, my photo didn't show up. This link will take you to an example of how to properly use wire rope clamps and what "saddling a dead horse looks like". I liked this very funny example of what happens when bureaucrats write paragraphs, without any editorial assistance.. "
It appears Sean was in the middle of the word 'gnarly'. Classic movie. Aloha, Mr. Hand. Where'd you get that jacket?! OMG, I really want to make my old bed to a LOFT bed. It has always been my dream to have something like that in my room! I love it! And I love all the projects you create, please never stop the creativeness the world needs it. Thank you so very much. Please note that a loft bed built into the frame of a building is a violation of building code unless it is accessed from a code-compliant stair. A ladder cannot be a component of a legal egress path. Sorry to be a wet blanket, but this is illegal construction. A bunk bed is no safer, but since it falls under CPSA regulation, it is not a building issue. Also, a lack of side rails is really dangerous if you roll around in your sleep. Really? Why does anyone care if its legal? I have often adjusted my living space in wqaysa that violate code, but guess what, since no one else but me was on the deed, I didn't ask anyone else if it was ok. I don't care either. My House, My kingdom, my way. I only once ran into an inspector who tried to railroads his way into my life and it wasn't a pleasant end for him. Not only did I win, but the city was forced to rewrite their code. Don't mess with the rights of People and their private property. It's up to you whether you follow codes or not, but should you ever want to sell your house, you could not only be in violation, but also financially responsible for any other events down the road - including fires and structural failures, long after you sell the house. I had that happen with an "illegal" septic system on a property I had purchased. It was too close to the well, too small for the # of bedrooms in house, and the dry well was put in place without permits. I had to have a triple tank solution installed, with aeration pumps, as there was zero room for a leach field. $15,000 later, not only the person who sold me the house, but the one who sold it to him 6 months before, had to shell out the $15,000 for the repairs. Luckily, none of my neighbors had their wells contaminated from it, otherwise they'd have to pay for every contaminated well to be redrilled elsewhere on the neighbors' properties. They did have to pay for all of the neighbors' water tests because of this. Housing codes are for the safety of you and your neighbors. Actually, the home sale contract has a little box to check that indicates house items may not be up to code, and that the house is sold as is with any code discrepancies the responsibility of the buyer. this is why you have a home inspected, and then negotiate based upon the findings. You had a very different situation, I agree that if a seller sells a home with problems hidden to the buyer but known to the seller that the seller is responsible, Also your case involved potential problems to neighbors. I am totally against any code or law that tries to protect me from myself. This bed shows no more dangers than a free standing bunk bed and no code should be enforced or written to prevent it and even if there were dangers, the bed is fully visible so any buyer should do his due diligence to consider the risks before purchasing it. Every product has liabilities and buyers should be made aware of risks that manufactures know about but not obvious to consumers, but the the product should not be restricted because of the risk. While even seat belts are smart to have and use, I think their use is up to the individual as we should not police personal stupidity. This bed does have some risks, but I support his freedom to evaluate them on his own. The reason this article caught my eye was that I made a few of these for my own kids and for some friends. They are actually safer than a free standing bed and I hate laws and codes that get in the way of personal freedoms. Rather than point out this author's potential leagal problems, why not point out to the law makers their stupidity. Just make sure your insurance agent never finds out. Illegal construction is one of the easiest ways to have a claim rejected.